Rosie is a re-homed leopard. Coming to us from another sanctuary, she was also raised in a very loving environment and craves human affection. Rosie was born in 2004 and is a favorite here in the jungle with her mesmerizing emerald green eyes. 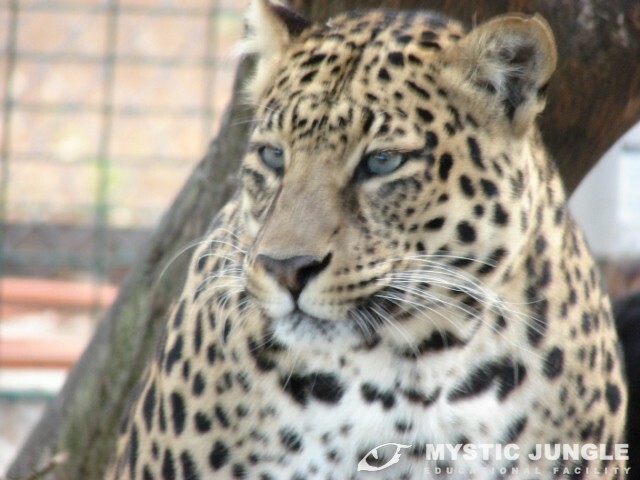 She is a tawny rosetted Indian Leopard and we are her second and final home. The owner of the sanctuary had a contingency plan and we were part of it and happy to help when the owners health began to fail. She arrived here with Sampson, Chewy, and Cheyanne. Little did we know that there was a special package aboard. Fury was born soon after their arrival here. Rosie and Sampson were thought to be barren as they had not had any cubs in years yet had remained together. They arrived in February 2010 and Fury was born March of 2010. Rosie has since been spayed and now can remain with her friend Sampson. Rosie is a very typical typey Indian Leopard, and astounds the crowds when she leaps from her atop her den box and lands all the way across her enclosure next to her perimeter fencing! !